This article is about the Gym Class Heroes song. For the children's song known as "Cookie Jar Song", see Who Stole the Cookie from the Cookie Jar? 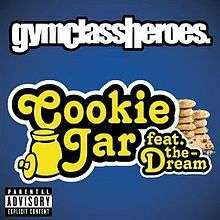 "Cookie Jar" is the second single from the Gym Class Heroes album, The Quilt. The song features The-Dream singing the chorus with Travis McCoy. It was released on July 8, 2008 on the Patches from the Quilt - EP. "Cookie Jar" peaked at number fifty nine on the Billboard Hot 100. Outside the United States, the song peaked within the top ten of the charts in the United Kingdom. "on the kind of dilemma that many guys have, like, they find a girl and then they're like, 'Oh, but I can have this one; it would be so much better.' Then they go to the other girl and they’re like, 'No. ... but I think this would be better.' The lyrics are based on the dilemma of trying to find the girl that makes you feel happy and having trouble with that." The video premiered on FNMTV on August 15, 2008. The music video has five different scenes. The first scene shows them in a room with blaring lights in the background. The second shows them in a white room singing to the camera. Third, is where the lead singer, Travis McCoy, is in a room with a woman who is supposed to be his girlfriend. Travis is in a room where he is sitting by a cookie jar which is the fourth scene. The fifth scene features Travis again where he is in a room with a greyish background. The music video has also appeared on the MTV show The Base Chart Show. In the United States, "Cookie Jar" peaked at number fifty nine on the Billboard Hot 100. In the United Kingdom, the song debuted at number sixteen on the UK Singles Chart on September 7, 2008 - for the week ending September 13, 2008 - on downloads alone, and went on to peak at number six, becoming Gym Class Hero's third top ten song in Britain at the time following Cupid's Chokehold in May 2007 and Clothes Off!! in August 2007. In Australia, "Cookie Jar" debuted at number fifty on ARIA Charts on September 21, 2008 - for the week ending September 27, 2008 - and remained there the next week. During its fourth week on the chart, it ascended to number forty four, and in its fifth week, ascended to its peak position of number forty one. ↑ "New UK Single Releases". New UK Single Releases. Retrieved 2008-08-20. ↑ BE! Interactive. "An Interview With Gym Class Heroes". http://www.mytelus.com/music/interview_details.do?id=779890 January 29, 2009. Retrieved: 8 June 2010. ↑ "Australian-charts.com – Gym Class Heroes feat. The-Dream – Cookie Jar". ARIA Top 50 Singles. ↑ "Gym Class Heroes – Chart history" Canadian Hot 100 for Gym Class Heroes. ↑ "ČNS IFPI" (in Czech). Hitparáda – Radio Top 100 Oficiální. IFPI Czech Republic. Note: insert 200836 into search. ↑ "Dutchcharts.nl – Gym Class Heroes feat. The-Dream – Cookie Jar" (in Dutch). Single Top 100. ↑ "Chart Track: Week 39, 2011". Irish Singles Chart. ↑ "SNS IFPI" (in Slovak). Hitparáda – Radio Top 100 Oficiálna. IFPI Czech Republic. Note: insert 200850 into search. ↑ "Archive Chart: 2008-09-27" UK Singles Chart. ↑ "Gym Class Heroes – Chart history" Billboard Hot 100 for Gym Class Heroes. "Cupid's Chokehold" / "Breakfast in America"